Los Tulares is a quarterly publication of the Tulare County Historical Society that appears in March, June, September and December. Members of the society look forward to receiving their issue in the mail every quarter. It serves two basic purposes. First of all, it keeps members informed about news and activities of the society, but more importantly it documents the history of Tulare County. Through stories and articles from contributing authors, Los Tulares has become a trusted source for our county’s history. Published continuously since 1948, Los Tulares is an amazing source for researchers throughout the world. The editors work hard at keeping it the pride of the society. The issues are fully indexed, and back issues may be ordered through our online gift shop. C.T. Buckman was born in Visalia, California March 28, 1889 near the Oval in north Visalia in a private residence as were most born in Visalia in that era. The “C” stands for Clement and the “T” is just that, an initial. Most close and good friends referred to him as “Buck” all his life but his wife, Edna Tschumy Buckman, mostly called him “Clem” particularly when he displeased her. He always got the message! Among Edna’s relatives was her brother, George Tschumy, Sr., who for many years managed Title Trust & Insurance Company in the 1930s, 1940s and 1950s as well as serving as Visalia Mayor in the 1930s and as Exalted Ruler of the Visalia Elks during that same period. Buck and Edna married in 1912 in Visalia at the First Presbyterian Church. Their first house they shared was on West Center Street in Visalia near Visalia Union High School. In 1915 they had their only child, a daughter, Lois B. (Buckman) Simpson, who in 1939 married Stanley S. Simpson, Sr. and in 1940 had their only child, myself, Stanley, Jr. who lives in the family home today. I have three children all born in Visalia and all Redwood High School graduates – Caroline, Diane and Melissa. Buck would have been proud of his six great grandchildren and two great, great grandchildren. Buck was educated primarily at Exeter High School and Visalia High School from where he graduated in 1907. His interest at the time was in civil engineering and bird hunting. As well, baseball was an important part of his life as he played at Visalia Union High School as a catcher and a couple of years out of high school played semi-professional in Bandon, Oregon. After that and marriage, he concentrated on earning a living as a civil engineer. One of his engineering highlights was in miscalculations in planning the “highest curb” in downtown Exeter, the only one in Tulare County! In 1916, in downtown Visalia one day, he purchased a health insurance policy from a friend. After paying the monthly premium for a few months, the friend offered to sell Buck his business, he accepted the offer and became an insurance agent. Soon afterward, he found out the seller owed a lot of premiums on past sales to the insurance company, around $2,000 which was a lot of money in that era. Buck made the payments good to the insurance company and was forever immersed in the insurance business. He officially started in the insurance business in 1916 and had a couple of partners for 3-4 years. In 1920, he convinced Hymy Mitchell, then a bank teller at the Bank of Italy on the corner of Church and East Main Street, which later became the Bank of America for years, to join him in the insurance business. Hymy at the time was making $50.00 per month so the offer to increase that cemented their lifetime relationship. Hymy Mitchell’s niece was Annie Mitchell, who was the Dean of Girls at Redwood High School for years and the County of Tulare Historian for years. In 1924, Buck and Hymy formed and incorporated Buckman-Mitchell, Inc. still known by that name and operation today. At that time their office was located 122 N. Church, and since then in order, 506 W. Main, 309 W. Main and currently 500 N. Santa Fe, all in downtown Visalia, basically. In 1933/34 Buck served as president of the Independent Insurance Agent’s Association of California, he was a founding member of the Visalia Rotary Club in 1921 as well as serving as president of the club in 1926. He was a founding member of the Visalia Country Club in 1921, and a prominent member of several other organizations such as the Visalia Masonic Lodge #128, the Shriners, Visalia Sportsman’s Club, Visalia Board of Trade (which eventually became the Visalia Chamber of Commerce as it is known today), Visalia Gun Club as well as other organizations all because of his belief in building a top notch community, Visalia. He was also one of several other local business leaders in the community to donate $ 1,000 each to the city for the lights at Recreation Park in the 1930s for night baseball and other activities which led to Visalia becoming an original member of the California League, a professional baseball league, in 1946 located ever since at Recreation Park near downtown Visalia. The first year of operation was in 1946 as we were known as the Visalia Cubs and now are known as the Visalia Rawhide. Perhaps, personally, his greatest achievements were in the field of sport bird hunting and trapshooting. As a young man, he learned the art from his father, Clement T. Buckman, Sr., who taught him all the mechanics of the sport, most particularly the responsibilities, respect of hunting and handling a shotgun. Buck never had an interest in or handled pistols and rifles, just shotguns. From the 1920s forward, Buck became a championship trap shooter in Tulare County, the State of California and in the United States. He belonged to the Tulare County Trap Club which he helped found, the California Indians and the Shoshone Trap Club associations. 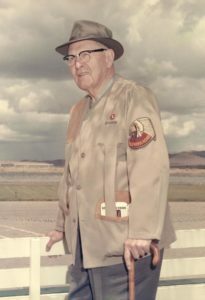 He won scores of shooting titles including the San Francisco Gun Club Title in 1924, Visalia Chamber of Commerce Visalia Gun Club title beginning in 1927 and later years, Modesto Chamber of Commerce High Gun 1931, several as in 100 plus shooting titles in his career. His most notable title was in 1947 when he won the title in the Vandalia, Ohio handicap division shotgun competition for the American Trapshooting Association as the best with a shotgun in the United States. He has been often referred to as the “best wing shot” with a shotgun in the United States. Many times in his experiences he would go dove or quail hunting with the limit being 10 birds and would only use ten shells! And he often loaded his own shells. By far his favorite hunting gun was a Parker Bros. 28 gauge, double barrels, side-by-side, 26 inches in length. In the 1970s with his chronological age in his 80s, he wrote and published his hunting memoirs in a book entitled 75 Years With A Shotgun. It was a story of his hunting life with the best parts being his experiences with all his hunting buddies, many from the Tulare County area being Jim Ingle, Burrel Hyde, Lucien Schmittow, Jim Fluty and many others too numerous to mention. In the book as well were many of Mrs. Buckman’s special game recipes as she was an outstanding cook. Buck was awarded the first Visalia Man of the Year in 1952 by the Visalia Chamber of Commerce. That was special as 1952 was the centennial year for the founding of the City of Visalia. Buck often said he lived in special time during our country’s evolution—turn of the century, World War I, the Great Depression, World War II, the Korean War, space exploration, the local floods of 1945 and 1955-57. His was a life well lived!! Would you like to view or search our Los Tulares Index?